If you’ve ever been perplexed as to why your cat will drink water from around the drain of your bathtub but not from her water dish, the article below by Mieshelle Nagelschneider* will give you some insight. We found this article on The Animal Rescue Site website, thought it was very interesting and wanted to share it with all of our cat loving friends. Do you ever wonder why your cat insists on pawing water out of your glass or lapping up the trickle from the kitchen sink instead of drinking from his own perfectly clean and full bowl? The answer may be in its location. Cats are great survivors, and drinking water that is not contaminated with bacteria is an important part of survival. When you place your cat’s food (which he will consider to be “dead prey”, store bought or not) next to his water bowl, his wildcat instincts tell him that the water could be contaminated with bacteria from the food. He will then search out what he believes to be a cleaner water source. I recommend creating a designated watering hole for your cat by placing his water bowl in a completely different location than where he is fed (or from where his litter box resides, for that matter). This separate location could be in an entirely different room that is easily accessible to your cat 24/7, or simply on the opposite side of the kitchen where you currently feed him. If you’re unsure of the best placement, introduce several locations and watch your cat’s behavior. He will show you which area(s) he prefers. If you haven’t yet tried a cat water fountain, you may be in for a treat. Not only can the shimmering and flowing water entertain your cat, but he may be encouraged to drink more water than he did from his stagnant water bowl. 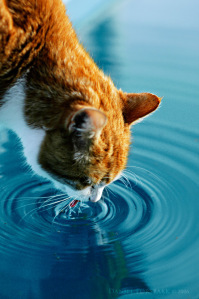 If you have a multi-cat household, creating several watering holes can help ensure that all of your cats are drinking a healthy amount of water, particularly if one cat is intimidated by other cats in the household and is fearful to visit the water bowl as often as he’d like. In fact, having only one watering hole for multiple cats often causes territorial tension, which leads to chasing and fighting. Remember, a well-hydrated cat is a healthy cat. Urinary tract issues in cats continue to be one of the leading reasons for veterinarian visits each year. Cat fountains and water bowls located away from food sources and litter boxes can encourage cats to drink more water, which in turn will help contribute to a healthy urinary system. A “watering hole” makes sense when we look at the environment through our cat’s eyes! *Mieshelle Nagelschneider is a cat behaviorist and author of the cat behavior book, The Cat Whisperer (Random House Publishing). 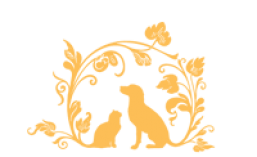 To learn more about Mieshelle or schedule a consultation with her, visit her website The Cat Behavior Clinic.